The answer to last week’s comic book trivia question is: Stray Toasters, by Bill Sienkiewicz. Great book, and one that played an important role in warping my impressionable young mind. Today’s episode is the 31st installment of the “Hell Hath Lots of Fury” storyline that began when the forces of Hell decided to come after the demon Malev’lynn. The character Malev’lynn has been around for a long time—he was created by D. Floyd French back around 1990. Malev’lynn starred in his own comic book series, drawn by D. Floyd, called Le Diable. Panel 3 up there is based on the cover to Le Diable #1, which is dated July 28, 1991. As you can see, D. Floyd has redesigned him a few times over the years. In 1994, D. Floyd drew the story where Fuzzball and Scuzzball meet Malev’lynn. 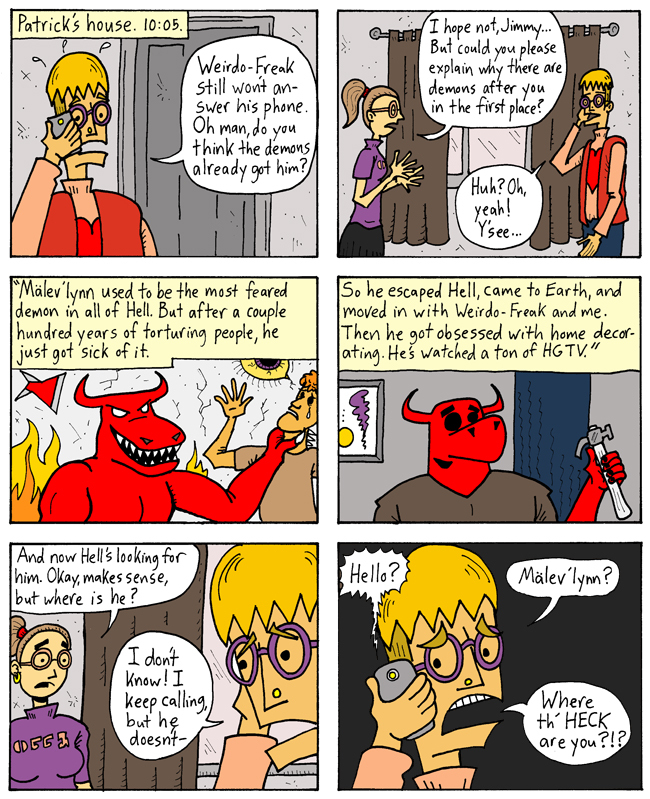 About ten years after that, D. Floyd drew the strip where Malev’lynn becomes Weirdo-Freak and Jimmy’s roommate. And awhile later, I drew a comic where Weirdo-Freak is worried about Malev’lynn’s pacing at night. This was supposed to be the set-up to a storyline that D.F. and I had come up with, in which we were eventually going to reveal that Malev’lynn was obsessed with HGTV and home decorating. I never got around to that reveal . . . UNTIL NOW. Next Week: Find out where Malev'lynn is!